“We’ve never even played the game before!” laughed the Danish captain as he paraded the trophy around the pitch. In one sense, he was right – participating in the inaugural three-sided football (3SF) ‘World Cup’, he and his teammates were playing 3SF for the first time. That being said, in 3SF the ball is still round, you still kick it with your feet, and much like the many other variations on football such as 5-a-side, futsal and the playground favourite Wembley Doubles (as we knew it, at least), if you’re used to kicking a round ball with your feet you’re not going to flounder uncontrollably. So, given the triumphant Danish team was composed of ex-professional footballers, they were used to kicking a ball about. They had played the game before. The World Cup was being played in Silkeborg, Denmark, the home town of artist and philosopher Asger Jorn, father of 3SF. Jorn conceived of 3SF in his 1962 book Naturens Orden, as a demonstration of his principle of triolectics. Jorn’s position hinged around the idea that in a two party stand-off the dominant party will always triumph, whereas by introducing a third party there will be a natural balancing effect. As any of the three begins to dominate the contest, the remaining two would form an alliance and outgun, out-muscle or, indeed, out score the would-be dominator. In order to fit triolectics onto the football pitch Jorn had to make a few tweaks to the beautiful game. An extra team would have to be added, of course, and to accommodate the extra goal that came with it the pitch would have to become a hexagon. But it was Jorn’s last tweak that set his version of football apart from all the others – the winning team is the one that concedes the fewest goals, rather than scores the most. This means that, in theory at least, no one team can pull too far ahead. If one team has conceded fewer than the other two, the trailing two will form an alliance, effectively ganging up on the leading team with double the players until their goal is breached and parity is restored. In the discussions following early 3SF matches much was made of the fact that teams can betray each other. It’s true, you can receive a pass from an opposition player only to immediately attack their goal, but it is a very short term strategy. Players will remember. Players will hold a grudge. This lesson was learned in the harshest of fashions when, in one early match, a striker received the ball from an opposing goalkeeper only to blast it straight back the way it had come and into the unsuspecting net. Unfortunately for the striker, the goalkeeper’s two sons were playing outfield and for the rest of the game they pummeled the betrayer’s team, ignoring any pleas of mercy or, quite accurate, protestations that the third team in the game would win if the onslaught continued. It was all to no avail; the wronged party sought vengeance, not victory. Rather than a game of betrayal then, 3SF is in fact a game of diplomacy. From minute to minute alliances are negotiated, enacted, revised, as the state of play continually fluctuates. Each attack, each switch of play, each goal has the potential to change the game plan of all three teams on the pitch as they try to eke out an advantage without inviting more pressure on themselves. You have to be able to score against someone and then somehow convince them to join you in attacking a common enemy, when you could just as easily be considered the very same. Fail in your diplomatic overtures, present a weak argument, or simply offend one or both of the opposing teams and you can quickly find yourself desperately defending your goal against an adversary that is quite literally twice your size. Defending against a strong alliance is exhausting, physically and mentally. Continually outnumbered, man marking becomes impossible. It is treacherously easy to be pulled out of shape as you are caught between closing down the player on the ball or tracking the runner that would otherwise be left free. Communication and discipline are key to surviving the siege, more often than not along with a large slice of luck. Survive and you will feel kings of the pitch, a brotherhood forged in the fires of adversity. Crumble, and you could well find yourself adrift of the match, dead by a thousand cuts. Attacking play comes with its own challenges. In the two sided game the objective is always clear, even if the solution may not be. By contrast, in 3SF game theory dictates that your objective is constantly being reassessed and altered as you try to negotiate the ever changing variables. Do you attack the weaker team, seeking to score them out of the game? Or do you attack the stronger team, forcing them to take on both their adversaries in an effort to get back into the game? Any goal is not always a good goal; score at the wrong time and you can provoke retaliation or change the momentum of the game in the wrong way. Confusion among teammates can see promising moves break down immediately, as the wrong run is made or the wrong pass played. It is common for players new to 3SF to remain stuck in the mentality of the two-sided game, passing only to players in the same shirt as them. However, if they can wrap their head around passing to the opposition they can put the third team in all sorts of trouble, as well as relieving pressure on themselves. Just don’t do it anywhere near your own goal. It is an exciting, fascinating time to be involved with 3SF. Every match teaches new lessons, sometimes immediately apparent in the fury of battle, sometimes not discovered until long after you have left the pitch, dissecting the game with teammates during post-match refreshments or in an idle moment on your own when replaing the game in your head. And then, it’s waiting for the next match when you can experiment with your new tactic, your new formation, your new cunning ploy, and finding if it yields reward or ruin. League play has brought with it an entirely new set of variables. As every goal goes in players furiously try to process each permutation of how that affects their league position, while still trying to play a slide-rule pass or shepherd an attacker onto their weaker foot. Logic is abandoned as grudges play out over an entire season and teams win the league defending another team’s goal (as happened in the penultimate game of the 2014-15 season – a tale to be told another time). NXI are crowned inaugural champions of the Luther Blissett 3SF League, having spent the final minutes defending Deptford 3FC’s goal. One thing that was learned very early on playing 3SF was that nobody likes a winner. Indeed, it is central to the game. It is widely acknowledged that going into the final third ahead will usually mean you’ll spend a lot of the remaining time defending that lead. But what to do? Intentionally concede in the hope the opposition will focus elsewhere? It hasn’t happened yet, but it shouldn’t be discounted. Another generally accepted maxim is that teams will gang up on the team who has had the temerity to win recent matches. 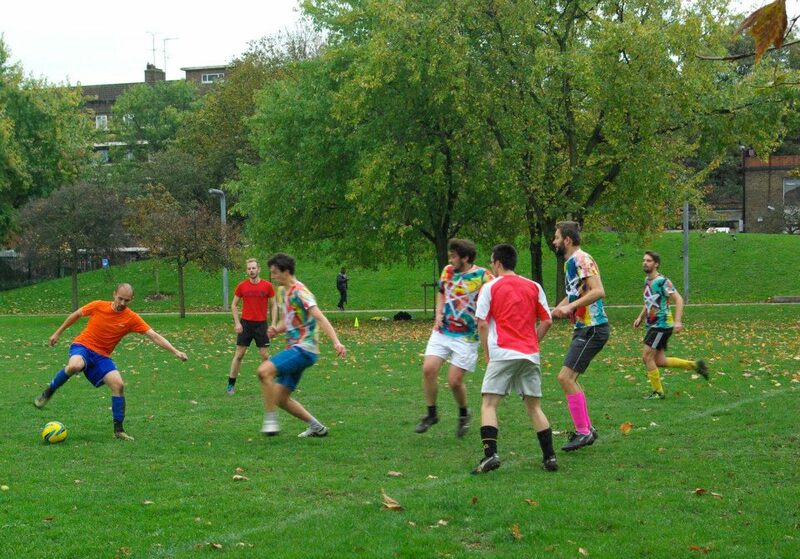 In the early days this was Philosophy Football FC, and since winning the league New Cross Irregulars have faced the dubious honour of heading into each match against a formal alliance between the other two teams. It is because of this that in three-sided football, the favourite will more often than not find themselves the underdog. Unless that team is filled with ex-professionals playing against those more used to jumpers and schoolbags for goalposts. The New Cross Irregulars registered their first clean sheet of the season to maintain their winning run and remain top of the league as the season reached its halfway stage. A foggy day in Fordham Park. Although the gap between matches had been no longer than usual, there was still a palpable “after the Christmas break” feel to the pre-match preparations. Happy new years were wished, Christmas stories shared, and more than a few faces belied internal questions of quite why they had decided to brave the biting weather on a muddy pitch so soon after festive indulgences. It is unclear if such questions were answered by the end of the day’s play. 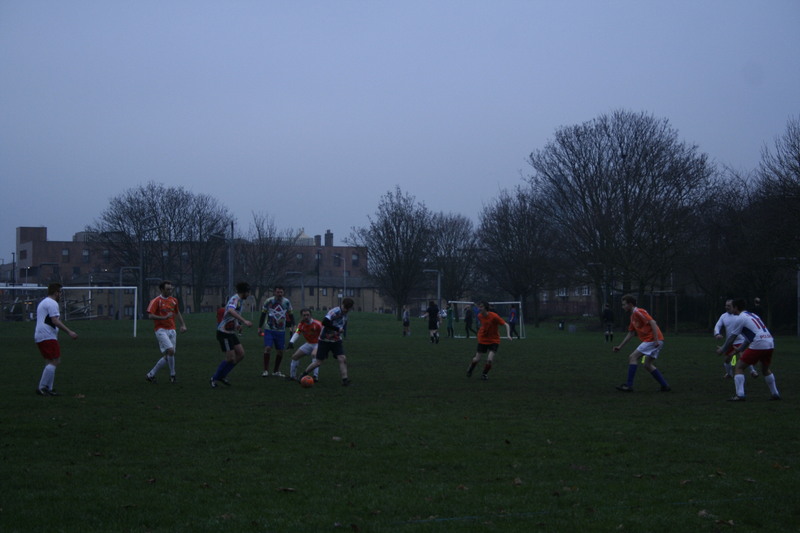 As league leaders, New Cross came into the January round of matches expecting to face an opposition alliance. The sight of both Harusia (a new year and a new name for the team previously known as Polscy Budowlancy) and Strategic Optimists players warming up together suggested these expectations were well founded. The first rotation was a traditionally tight affair, with NXI doing a decent job of disrupting the opposition alliance. The only goal came towards the end of the rotation, following a characteristically fluctuating passage of play that saw all three goals come under attack. The move started as an attack on the goal of Strategic Optimists, but the SO defence managed to gain control of the ball and launched their own offensive on NXI, supported by the Harusia players who moments ago had been their adversaries. However, NXI’s Will Simpson was able to clear into space where Tristan Carlyle, who had been Simpson’s partner in defence for most of the rotation, ran onto the loose ball and stroked it inside the Harusia post with an assured finish that suggested he should perhaps venture forward more often. 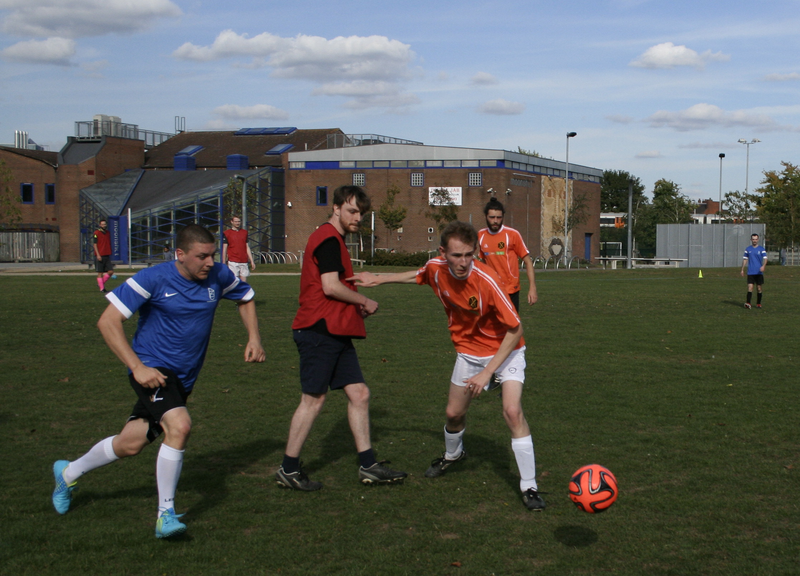 Teams battle for possession in the middle of the pitch. Although Carlyle’s strike had been the only goal of the first rotation, at the start of the second it appeared as though the floodgates may have opened as two goals were scored in quick succession. The first was a fine collaborative effort between Harusia and NXI, with players from both teams patiently playing the ball across the edge of the SO box before an incisive through ball found the run of Harusia’s Alex Morgiel, who scored to make it 1-1-0. It is an odd quirk of 3SF that Morgiel’s goal brought his team level with one opposition, but still left them trailing the team who had actually helped create their quasi-equaliser. Unfortunately for Morgiel and his team, even this slender parity did not last very long. A ferocious strike from SO’s Pat Davies could only be parried by Harusia’s goalie, and though Davies’ follow up was not as clean as his first strike it fell to NXI’s Striker-in-Chief Laurence Galpin, who slotted in at the far post. Despite this early promise, those proved to be the only two goals of the second rotation, NXI’s disciplined defence doing a good job of limiting both oppositions to long-range efforts which either failed to hit the target or were comfortably dealt with by NXI goalkeeper Ben Borowiecki. The start of third rotation saw an interesting development for a game where it is notoriously dangerous to take a lead into the final rotation. At 2-1-0, SO seemed to be in the stronger position of the two trailing teams and perhaps expected an alliance with Harusia against an NXI team that was yet to concede. However, with the scoreline so tight it was actually in both their oppositions’ interests that SO concede again, as it would draw them level with Harusia and afford NXI some breathing space as they looked to secure their fourth outright win in a row. And so it was that Harusia’s Morgiel turned provider, feeding Galpin who collected the ball with his back to goal before turning his man and firing a low shot into the left corner of the SO goal to bring the score to 2-2-0. Clearly frustrated with the lack of value coming from the NXI defence, Harusia and SO increasingly turned their attention to each other as they searched for the goals that would ensure they didn’t pick up the maximum two points for a losing result. SO in particular were keen to improve on previous results which had yet to see them avoid a losing draw or outright loss. NXI naturally welcomed the change of dynamic, which both relieved the pressure on their own goal and allowed them to play a more expansive and adventurous game. They would go on to take full advantage with a further two goals. Galpin completed his hattrick with a well taken goal against Harusia, and then assisted Borowiecki, fresh out of the NXI goal, who made a late run into the Harusia box and turned in Galpin’s cutback without breaking his stride. Borowiecki scores his long-awaited first goal of the season. With the game drawing towards a close, there was still time for Owen Proctor-Jackson, Borowiecki’s replacement in goal, to make a commendable save, diving to his right to turn an SO shot round the post and maintain the clean sheet his predecessor had left in his care. Soon after the final whistle blew and brought an end to the first match of 2015, the final score standing at 4-2-0. NXI maintained their lead at the top of the table and SO’s hard work was rewarded with a deserved second place, their ‘keeper in particular having a good match with a string of smart saves to keep his team in the game. With 5 of 10 maches played the Irregulars have put themselves in a strong position, but know they go into the second half of the season with a cross on their backs. NXI ended 2014 two points clear at the top of the league after their third victory in a row against two teams who have been playing 3SF in Deptford since it’s inception. 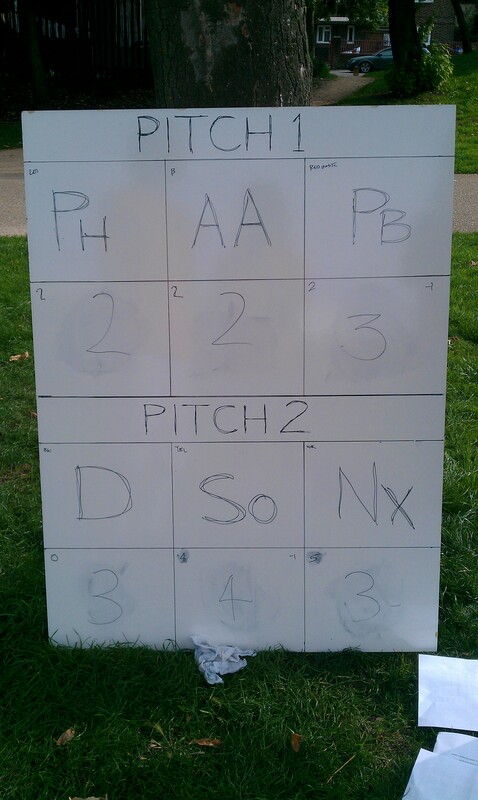 As expected between three experienced 3SF teams, the opening rotation was a tight affair. The first goal came as a result of a lightning alliance – as NXI probed towards the Philosophy goal, a quick change of plan saw players from both teams descend upon the Polish goal. The Polish ‘keeper could only parry a shot from NXI’s John Michell and Michael McCann of Philosophy was there to poke in the rebound. NXI had started the match in an attacking 2-2 formation, with Michell and Khairil Hodgson playing ahead of Tristan Carlyle and Will Simpson. Unfortunately for the men in orange it left them vulnerable at the back; having already survived a couple of scares, they finally conceded as a through ball split open their defence and onrushing ‘keeper Owen Proctor-Jackson was unable to keep the ball out of the NXI net. Philosophy 3FC held on to their clean sheet and so the first rotation ended 0-1-1. The second rotation would see four more goals scored, and predictably enough it was the team who started the rotation ahead, Philosophy FC, who came under the most pressure. They conceded their first goal to a veritable thunderbastard of a shot from Polish captain Greg Morgiel, fresh out of tending his own team’s goal in the first rotation. During his time between the sticks there had been a couple of heated exchanges between Morgiel and NXI forward Hodgson, but it is a testament to both players’ understanding of 3SF that both combined effectively to attack the Philosophy goal in the second rotation, and it was Hodgson who set up Morgiel’s goal. Hodgson was also involved in the next two goals. First, cutting a dangerous ball back across the Philosophy goal which retreating defender Ally Clow deflected into his own net, the type of own goal that is all too familiar to football fans and players alike. Hodgson finally got on the scoresheet himself as Philosophy conceded their third goal of the rotation, poking the ball past the Philosophy ‘keeper following a goalmouth scramble just as familiar as Clow’s own goal. Philosophy FC were now trailing 3-1-1, but ended the rotation with a second goal against the Poles. Once again they scored by switching the focus of their attack, this time turning on the Polish team who had been left exposed as they pushed forward to support the initial attack against NXI. This left the score after two rotations at 3-2-1. Entering the final rotation in the lead, NXI expected to meet with the same sort of onslaught that Philosophy had faced in the second. However, they never found themselves under the concerted pressure that traditionally faces the team that goes into the final rotation in the lead. Perhaps the Poles were reluctant to ally with a team who had so recently and so coldly betrayed them; perhaps both Polscy Budowlancy and Philosophy were keen to avoid the two points that would accompany an outright loss; perhaps NXI’s diplomatic efforts had been more effective than they had realised. Whatever the reason, NXI were happy to support their opponents in attacking any team that wasn’t playing in orange, and Polscy soon got their vengeance against Philosophy with another goal to make it 4-2-1, Hodgson once again providing the assist for the opposition to score. A third goal against Polscy gave NXI some breathing room which would prove vital shortly after as they conceded to a potent Morgiel father-son combination. As father Greg played the ball to his son Alex down NXI’s left wing, Proctor-Jackson was caught out by a smart turn from the youngster who still had a lot to do as he shot from a tight angle and snuck the ball inside NXI’s near post. It would prove to be the last real action of the match, as NXI played out their third consecutive win to end 2014 in first place. Final score: 4-3-2. You’ve been very kind in your praise for our match reports, but it’s clear you agree with us that they need more photos! 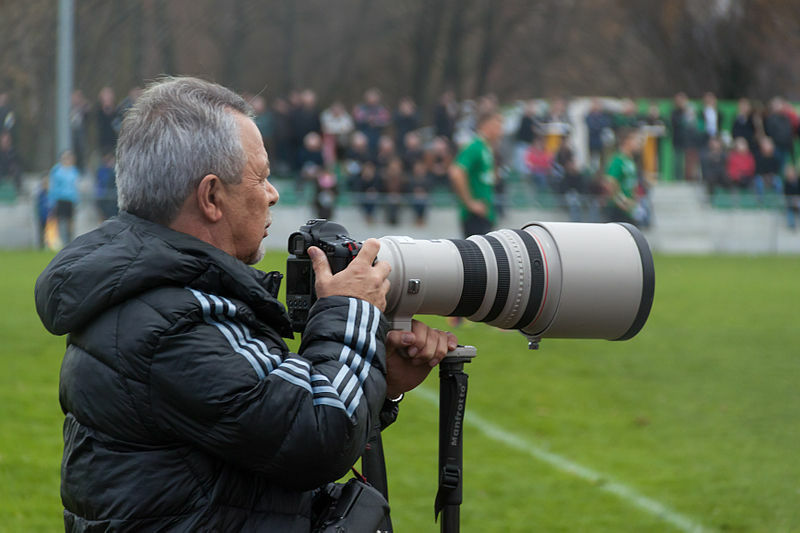 So, we’re looking for someone who would be interested in taking some photographs while we hurtle around the pitch. We play on the first Sunday of the month (next match 07 Dec) and we’d be happy for you to attend every month or just as and when you can. We can even supply a camera! A match that at one point looked like it would be overshadowed by squad limitations and grim weather blossomed into “one of the best 3SF matches in recent memory”, as NXI lost and ultimately regained the lead to remain at the top of the league. The omens for NXI were not good. The lack of depth in their squad had been cruelly exposed as two players succumbed to injury and their top-scorer, Laurence ‘Goals’ Galpin, was out of town, leaving only two regular Irregulars on the team sheet as the first Sunday of November rolled around. With the weather seemingly finally realising autumn had arrived, it looked like the league leaders faced a decidedly gloomy afternoon. However, as the rain relented and NXI secured a couple of last minute loan signings, it looked like a small sliver of fortune still favoured the team in orange. The build-up to the match was also notable as Strategic Optimists finally unveiled their new strip. Created via a process that involved a lot of paint and seemingly little regard for order, each shirt is unique and the pride of the SO players was only matched by the admiration of players from other teams. The makeshift NXI team made an impressive start to the match, with Deptford 3FC loanee Mark Dyson and 3SF debutant Khairil Hodgson both scoring against pre-season favourites Philosophy FC. 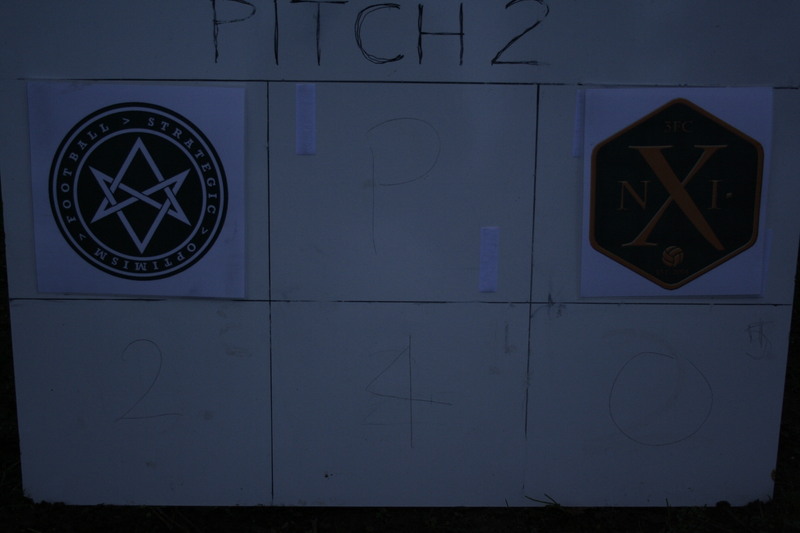 Following a series of close chances for all three teams, Philosophy got themselves on the score sheet courtesy of a goal from Michael McCann against Strategic Optimists, leaving the score at the end of the first rotation 2-1-0 in favour of NXI. Leading in a 3SF match is always something of a poisoned chalice, and so it proved for NXI. Under concerted pressure, NXI displayed some characteristically resilient defending to deny both opposition teams for much of the second rotation, aided by no small amount of luck as the frame of their goal was struck three times. Eventually though they would concede two very similar goals that highlighted one of the key challenges in defending a lead against two teams. As NXI players got caught between closing the ball down and tracking the run of another player, twice they chose the former and twice the ball was played behind them for the unmarked McCann to complete his hattrick. NXI struck back with a breakaway goal against Philosophy, finished by Owen Proctor-Jackson following some good interplay between himself and Hodgson, but ended the rotation conceding what would prove to be SO’s only goal of the match, but a goal which completed their poaching of the lead as they ended the second rotation on the right side of a 3-1-3 scoreline. The start of the final third saw a fully formalised alliance between the two trailing teams, as NXI and Philosophy eschewed any opportunity to attack each other and instead lay siege to the SO goal. More resilient defending – this time from SO – was rewarded with more goals conceded, as McCann and Proctor-Jackson both added to their tallies for the day. This levelled the scores at 3-3-3, and despite a suggestion from some of the Philosophy players that it was now “every team for themselves” the red-orange alliance held long enough for McCann to score his fifth goal of the day against a deflated SO side. It was now truly a shoot-out between players who moments ago had been teammates as NXI and Philosophy traded blows with SO offering willing support whenever the opportunity arose. It is fair to say that some blows struck harder than others, and Dyson demonstrated his commitment to his adopted team by suffering a ‘gentleman’s injury’ in order to prevent one particularly vicious strike. As full-time and a winning draw beckoned, NXI broke forward once again with Hodgson and Proctor-Jackson. As Proctor-Jackson brought the ball forward, Hodgson made a smart diagonal run from right to left, dragging the Philosophy defence with him and creating the space for Proctor-Jackson to sprint into the Philosophy penalty area and put the ball past the advancing ‘keeper, completing his own hattrick. Although there was still time for Philosophy to launch a final campaign against the NXI goal in an attempt to salvage something from the day it would ultimately prove unsuccessful. The match ended 4-4-3, NXI securing their second win of the season and staying top of the league. As the sun fell behind the surrounding buildings, players from all sides came together to shake hands and enthusiastically dissect a match that had been yet another fine example of the unique characteristics of the three-sided game. NXI came from behind in a tight second match to record the league’s first outright win of the season, putting them top of the fledgling league. In a curious turn of events NXI started the match where they left off the previous one, in an alliance against Strategic Optimists, Atheltico Aesthetico proving more than willing to join in the attack even though nothing had been agreed beforehand. However, if NXI and AA had expected this alliance of convenience to sweep SO aside they were to be sorely disappointed. 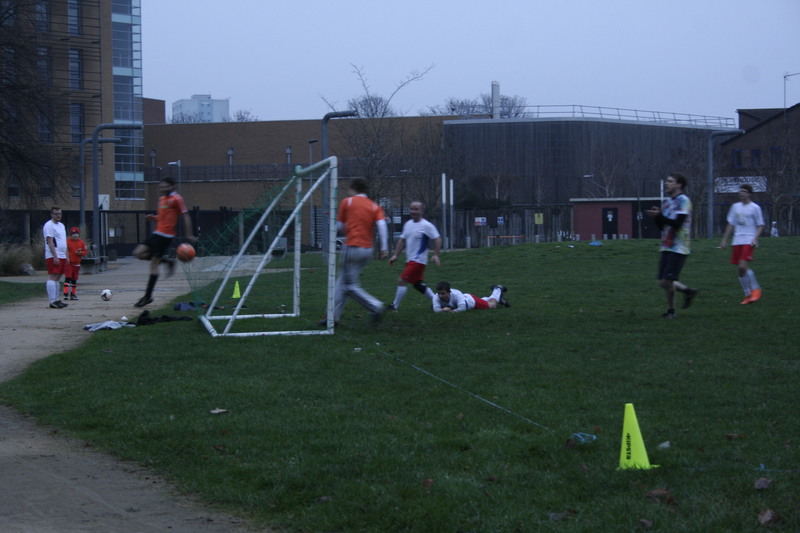 Led by some superb goalkeeping from Mark Rainey, SO successfully repelled attempt after attempt from both NXI and AA players, and frustration festered into exasperation as the two teams toiled to breach the SO goal. SO finally conceded, with NXI conceding next to leave AA with the only clean sheet in the match. 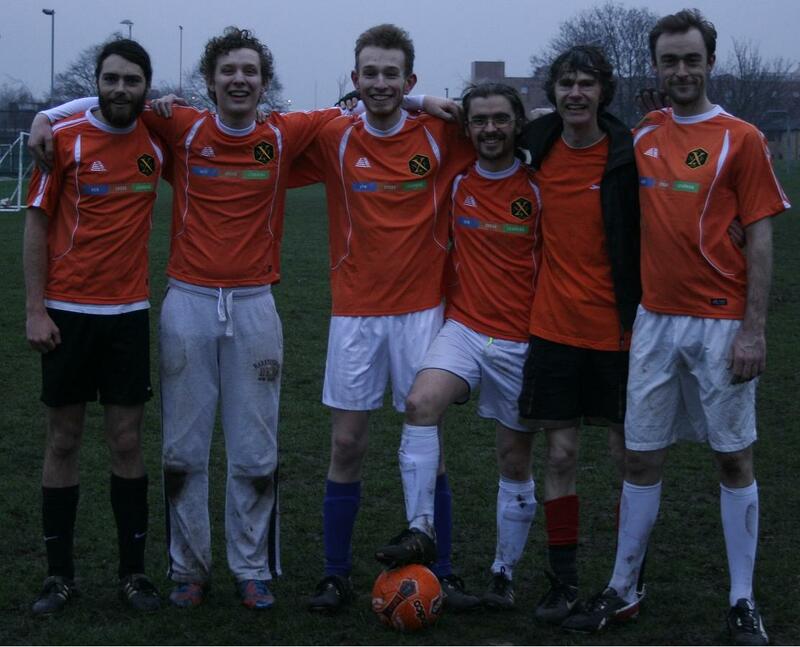 With SO conceding again to put the score at 0-2-1, AA were feeling confident of securing the win. Instead though, the victory would end up going to NXI as two goals from leading scorer Laurence Galpin turned the tide, and the scoreline, in favour of the Cross. 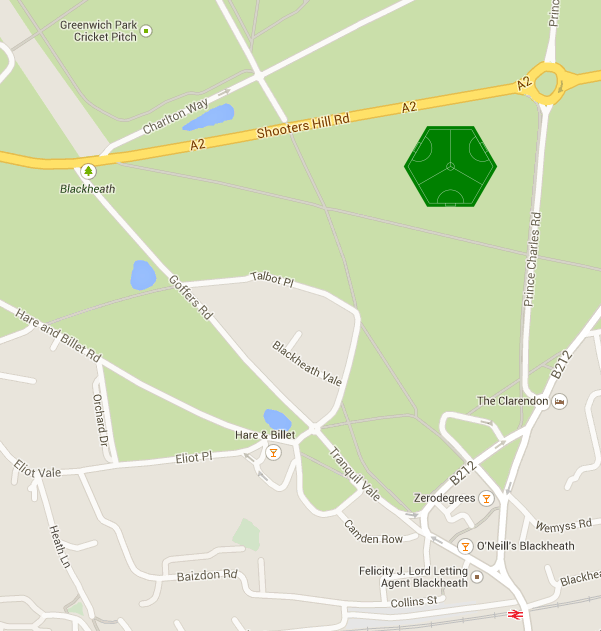 This will be a perfect chance to experience three-sided football first-hand in an informal match on Blackheath Common. Everyone will get a game, so whether you’re young or old, male or female, Angel di Maria or Anton du Beke, come along and join us as we put theory into practice. Teams will be put together on a semi-ad hoc basis, so whether you’re an individual or in a group we will make sure you’re in a team. Spectators are also very welcome to attend. If you plan to attend we would appreciate it if you let us know you’re coming, just so we have a rough idea of numbers and can plan accordingly. You can join the Facebook event page here, or get in touch with us directly. 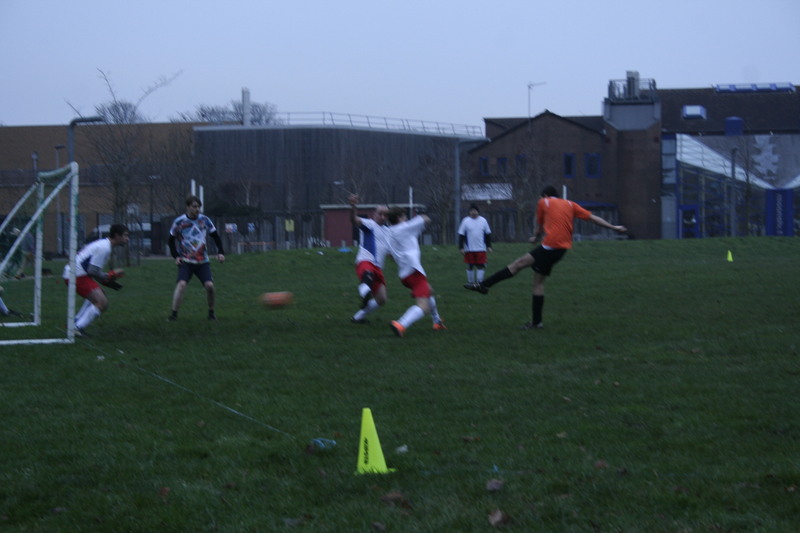 Anticipation and excitement were in the air as players gathered for the opening game of the first fully-formalised Deptford 3SF League. Although many players had over two years of 3SF experience this would be the first time playing in a league structure, with fixed squads and results counting towards more than mere post-match bragging rights. Before the season could start it had to be formed, and that meant fixtures. In an attempt to ensure a fair distribution, fixtures were to be allocated on a semi-random basis – a fixture list had already been drawn with letters a-f taking the place of team names, and before the first round of matches representatives from each team picked a letter out of a bag to seal the fate of their team. The full list of fixtures can be found here. While each team was keen to pour over the newly formed fixture list that would have to wait, as it was straight on to the first round of matches! For New Cross Irregulars, this meant a tough match against league founders Deptford 3FC and relative newcomers Strategic Optimists. The game started in traditionally tentative fashion – without a clear adversary at the beginning of 3SF matches, teams can often be reluctant to be too aggressive as they try to avoid upsetting the delicate diplomacy that informs a lot of 3SF gameplay. But first blood must be drawn, and the opening goal of the new season went to NXI’s Laurence Galpin, scored against Deptford 3FC. It would prove to be a prolific day for the NXI striker, and he quickly added to his tally with a second against D3FC and one against SO. With NXI’s goal enjoying a relatively untroubled third they went into the first break in the lead, with a score of 2-1-0. As the match resumed, the NXI team were under no illusions as to what the second third would bring. 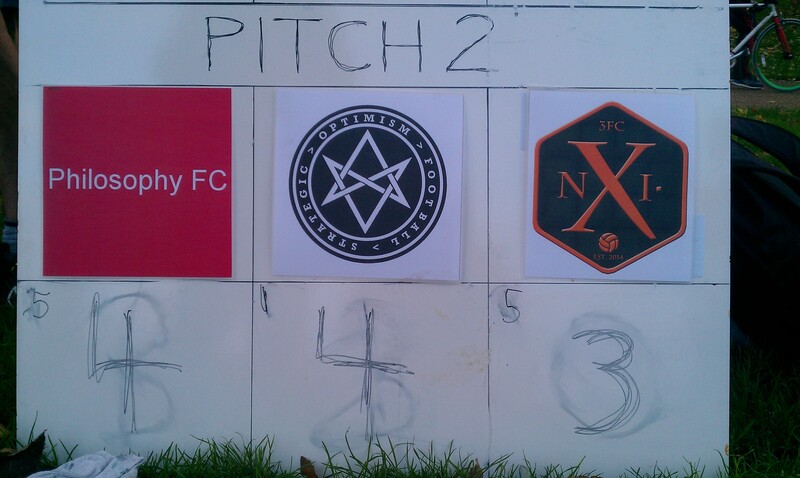 Being in the lead in a 3SF match invariably invites pressure onto your goal as the opposing two teams look to restore parity, and so it proved once again D3FC and SO joining forces to lay siege to NXI’s goal. 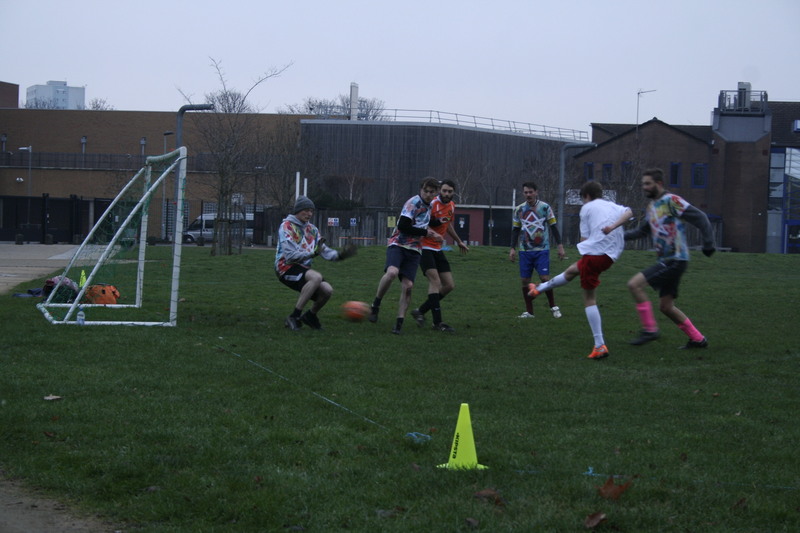 Despite some sterling defensive work from the entire NXI team, the pressure eventually told and they conceded three goals to SO players to end the second third in last place. The final third started with SO keen to continue the alliance they had formed with D3FC, but for reasons that remain unclear the team in black proved more evasive, seemingly happy to follow play in whichever direction it flowed so long as it wasn’t toward their own goal. NXI sought to take advantage of this shift in dynamic and through a combination of opportunistic play and a frankly bizarre own goal the game was back level at 3-3-3. With the final whistle approaching there was still time for one more goal, inevitability scored by Galpin who collected the ball in front of a crowded SO area and showed excellent composure to slot the ball through the bodies and into the SO goal. Despite further chances against each team no more goals were scored and the game ended 3-4-3, with NXI 33FC and Deptford 3FC sharing a ‘winning draw’ (for further explanation of 3SF results see here). As players shook hands and dragged their weary bodies from the pitch it was agreed it had been an excellent 3SF match with archetypal swings in momentum and numerous examples of deception and switches of play. This was one match in a season of ten for NXI, and while the team were happy to come away with the winning draw there was definitely a sense that there had been a chance of an outright win and the team showed plenty of potential which they hoped to build on as the season progressed. 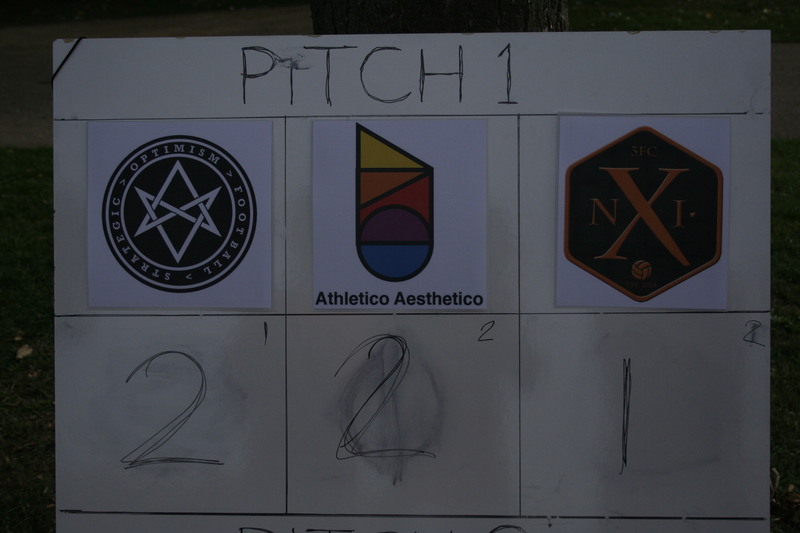 The other match of the first round also saw a winning draw, shared between Philosophy 3FC and Aesthtico Athletico, with Polscy Budowlancy suffering the defeat in a 2-2-3 scoreline. The next round of matches will be played on Sunday, 5 October, kicking off at 2pm.